Thanks to oldbollysongs for posting this great video! 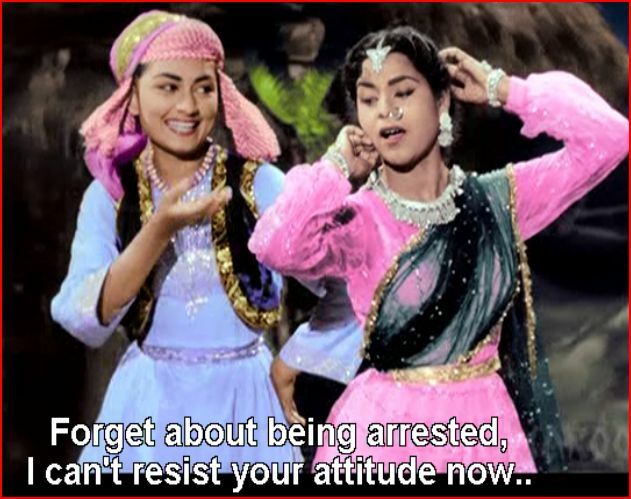 Reshmi Shalwar Kudta Jali Ka from Naya Daur (New age) a Bollywood Classic song from an excellent movie re-made in color version. This song is brilliantly sung by Shamshad Begum. 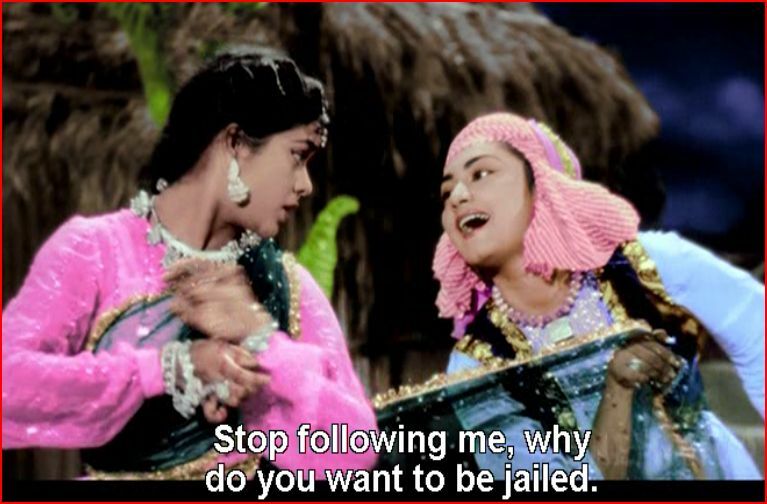 Naya Daur is a 1957 Indian drama film starring Dilip Kumar, Vyjayanthimala, Ajit and Jeevan. Originally filmed in Black and white, the film was colourized and re-released on 3 August 2007. Lyrics in Hindi, and if you find them in English or want to translate them, please post. Ooh it’s so PINK! I have only seen this film in black and white, and it’s a good one. I especially love this song, and pretty much every song Sahir Ludhianvi wrote lyrics for. I may need to get the colorized version after all! Namaste memsaab. I was able to pick this one up at my local library. 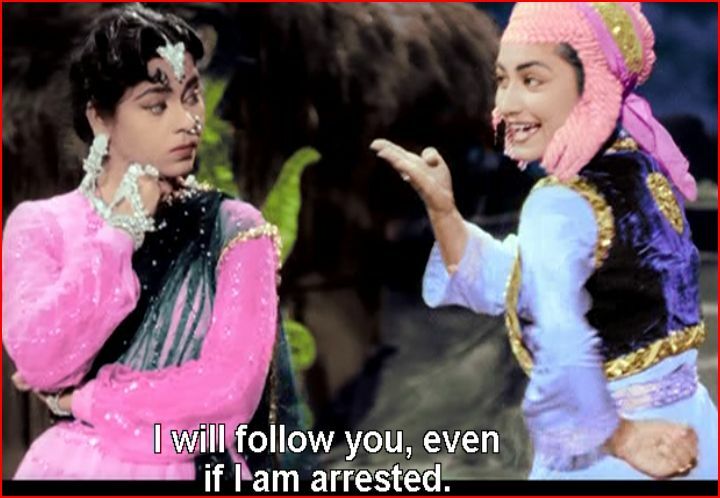 It’s like the color in the colorized Mughal-E-Azam, rich and oh so technicolor. Living color! I love pretty bollywood lady and fine bollywood edibles. Yum Yum and a piece of gum. This comment is so annoying. Maggie! Beep Beep! You cannot hide behind virginia’s name! I want to write “and whatnot” here, but don’t want to sound stupid, so just know I’m thinking it. Do you like the gender bending video? Its my favorite thusfar and whatnot. on April 16, 2008 at 12:16 am | Reply Richard S.
I adore this song, as with all the songs from the truly excellent Naya Daur. My favourite lyricist Sahir writing the words for my two favourite playback singers to sing, it doesn’t get much better than that. BUT I hate the eye-bleedingly awful colourisation. I am so very, very glad, my copy is B&W, and wish they had left well enough alone by not turnnig a classic film into some psychedlic toddler’s painting fantasy.